Many doctors in Việt Nam are preferring to work in private hospitals rather than in public hospitals. This is because they find it nicer to work at the private institutions and the pay is better. This trend is a worry for the country because it causes problems for hospitals that ordinary people need and use when they are sick or injured. Authorities are now thinking of how to change things so that fewer doctors leave the public hospitals. ĐỒNG NAI – More talented and experienced doctors are leaving public hospitals to work in private facilities, raising concerns of a shortage of key doctors in the public sector. Low salaries and poor working conditions were among reasons given by doctors leaving public hospitals. 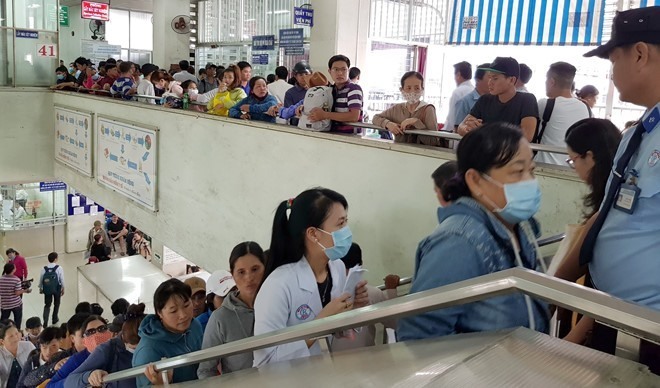 Figures from southern Đồng Nai Province’s Department of Health show that the number of doctors leaving public hospitals for private facilities has increases over the past few years. In 2016, as many as 65 doctors quit their jobs in favour of the private sector. The number increased to 98 in 2017 and 102 in 2018. Since early this year, 11 doctors from public hospitals resigned to move to private centres. Dr Lê Thị Phương Trâm, deputy head of Đồng Nai General Hospital told Thanh Niên (Young People) newspaper that 32 doctors decided to leave the hospital. Of that, three were deputy department heads and eight had post-graduate degrees. Most were young doctors with 2 to 5 years of working experience, she said. The health sector in HCM City is facing the same exodus. As many as 23 health workers, including six doctors and six nurses, have gone on to pursue employment at private hospitals. PhD Tăng Chí Thượng, deputy director of HCM City’s Department of Health said he was afraid the trend would continue. The brain drain was alarming, affecting leading hospitals in the city, he said. It was necessary to have an intervention otherwise the situation would lead to a domino effect, he said. Dr Lê Thị Phương Trâm said Đồng Nai General Hospital took a survey on the salary doctors wished to receive each month. Most said they wanted between VNĐ20-25 million (US$864-1,080) per month. To meet the expectation, the hospital was planning to diversify medical examination and treatment to increase the income of the doctors, she said. But many doctors said there’s more to it than money. Director of Thống Nhất General Hospital in southern Đồng Nai Province Phạm Văn Dũng said apart from low incomes, there were other reasons for doctors seeking private employment. Nguyễn Hoài Nam of HCM City’s Medical University said many left their jobs as they no longer felt happy and comfortable with the working environment. The income was not the key factor for them leaving, he said. Tăng Chí Thượng said well-paid doctors still resigned as they had little chance of studying abroad or doing research to improve their professional skills. Bùi Thành Chi, former deputy head of Hà Nội-based Bạch Mai Hospital said qualified doctors working at public hospitals like Viêt Nam-Germany or Bạch Mai rarely wanted to switch jobs to get more money. A professional working atmosphere with research and advancement opportunities would be the key factor helping doctors devote themselves to their work, he said. To be talented at something means to have a natural skill to do it. The public sector is the sector of the economy that is owned and run by the government. Salaries are payments given to people by their job for doing their work. In 2016, as many as 65 doctors quit their jobs in favour of the private sector. The private sector is the sector of the economy that is owned and run by the people or companies. To resign means to choose to end your job. Of that, three were deputy department heads and eight had post-graduate degrees. Post-graduate degrees are degrees people study towards, which they can enrol for only after having first got a degree known as an undergraduate degree. The health sector in HCM City is facing the same exodus. An exodus is the departure of a large number of people from a place at much the same time. As many as 23 health workers, including six doctors and six nurses, have gone on to pursue employment at private hospitals. To pursue something means to try to achieve it. A trend is a pattern. An intervention is a treatment that is given to a problem in the hope of fixing it. When a domino effect happens, things go wrong, one after the other. A survey is a study that is based on doing a count. To diversify means to expand. Income is money that people earn. Things are done professionally when they are done properly and by people who are properly qualified to do them. An atmosphere is a mood. This would help retain talented and qualified doctors at public hospitals. To retain talented and qualified doctors at public hospitals means to keep them there. The number of HCM City doctors who have gone to pursue employment at private hospitals. The number of HCM City nurses who have gone to pursue employment at private hospitals. A word that means “not often”. Somebody who knows a lot about something.